Tent & Party Rentals - Lowest Tent Rental Rate Guaranteed! 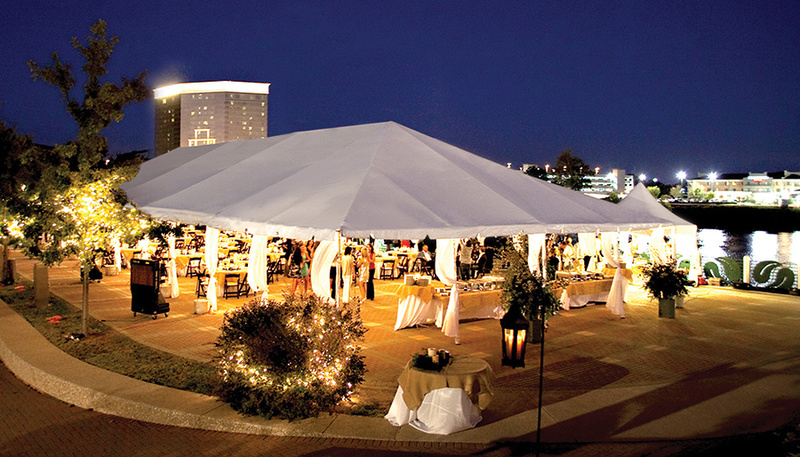 Event Rentals Miami prides itself on friendly tent, party, and wedding rental service. Our staff is always willing to help. We are also the most flexible, and understanding event rental company in the Miami, FL area. Problems happen, and we will work with you to make sure that you are always satisfied. This is the Event Rentals Miami difference. 1. Determine the number of guests at the party: This factor is important because you do not want to have too small a tent, or too large a tent for the wrong number of guests! 2. What type of party is it? : Now that you have an estimate of the number of guests at the party, it is important to factor in the amount of space each individual will occupy under the tent. Generally speaking, at a formal stand up event with some seating, each person will require about 8 sq ft of space. For a party event with dancing, each person needs about 16 sq ft of space. You also need to factor in the relative sizes of tables. 4. Concrete vs. Grass: Event Rentals Miami uses frame tents on either concrete (any hard surface) or grass. Deciding on which type of surface you want to set up the tent rentals is a crucial factor. Grass usually does not require the use of tent weights because anchors are driven into the ground. However, you must let us know if there are any ground obstructions or utilities to be aware of prior to any installation of a tent on a grass surface. Setting up on concrete is easier in some ways because there is no need to worry about underground obstacles. Usually, it is recommended that tent weights are installed with the tent to ensure structural rigidity.